Our Adult program offers comprehensive fitness training. We provide a healthy program for building your confidence and physique through endurance, flexibility, and strength training with greater variety than traditional exercise. Also giving the added benefit of self-defense skills and an increase in mental and emotional strength for a greater personal security. You will gain positive relationships with motivated instructors and enthusiastic people. Many parents are also looking for more opportunities to spend more time with their families. World Champion Taekwondo in Gresham provides that opportunity. We provide special classes for families to attend together and train side by side. You will be learning an exercise program everyone can enjoy, in a positive and healthy environment. All while having fun and remaining in great shape! Adult and Family Martial Arts in Gresham Offers Benefits that will Last a Lifetime! 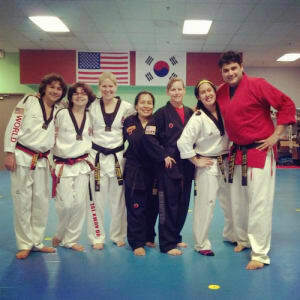 Whether this is your first time trying Martial Arts or you are on the way to your black belt, Adult and Family Martial Arts in Gresham has something to offer everyone! Our skilled and seasoned instructors are dedicated to you and your goals. We want to see all of our students succeed, and will do anything to make that happen. If you are looking to get in amazing shape while also bonding with your family, then this is the class for you! If you would like to enroll in Adult and Family Martial Arts, please fill out the short form on the right side of this page. When you do, we will provide you with all the necessary tools and information to take advantage of this opportunity! We look forward to seeing you on the mat! Taekwondo has been a great match for my daughter. We learned of World Champion with a free trial after she had the opportunity to break a board at the Gresham Car Show. Master Kim and all the instructors have been so good with my three year old. The work they encourage in class is building stamina for my little one and all the hard work is transferring to home! She is offering to help, listening the first time, learning appropriate timing, showing respecting, learning cause and effect, understanding if/then and saying "got it" if not yes sir or yes mom/dad. I appreciate how they meet my child where she is at each day and encourage her outgoing personality. They're patient and know balance. I look forward to seeing her clean up after herself some day! We won a free month trial with Master Kim. After our first class we were hooked! Its been a year, and many belts later, and we hope to continue for many more to come! Thank you all for your dedication, professionalism, and most of all, your respect for the little 'Tiny Tigers'. Master Kim and his other masters and instructors have been training my son since he was four. He is now a second-degree Black Belt, and his brother has been in classes for a year. They absolutely love kids, and are great with them.